The E-Wallet is an electronically stored numeric valued figure which is earned mainly from referring new participants. Its SI value is the TKS. The TKS can be compared to other Currencies such as the NGN, AED and others. The Ecommerce Store sponsored by Twinkas accepts only payments with the Tks. E-Wallet guarantees E-commerce dealings easiness and safety. You must have an active account to trade with TKS. Kindly Note that this Earning is continous as long as the Referral participates in the LSMP Cycle. An Increment in the Referrals GD increases the Amount of Tks coming into your account. A. TRAVELLING AND TOUR: Book any flight of your choice with just 80TKs units only on domestic airlines. B. ECOMMERCE SHOPPING: You can purchase any desired product of your choice from the Ecommerce Store with the correct amount of units. C. TUKOX TRADING: Tukox works in two ways; Cryptocurrency price prediction game and Tukox market prediction game. Cryptocurrency price prediction game: You can bet on major cryptocurrencies but limited to Tks and see where the price go in the short term. The game results are recorded in cookies, so you will be able to continue from where you stopped last time. 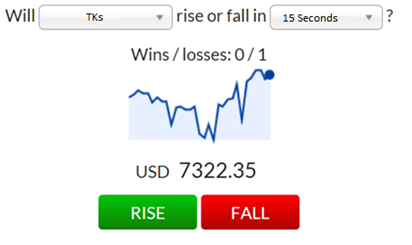 Tukox market prediction game: You can measure your financial skills and see if you can forecast short term movements of major currency pairs. Do you think TKs will go up against USD in 30 seconds? 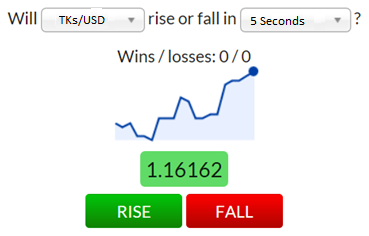 Or maybe GBP will drop against EUR just in 5 seconds? You can view your TKS capital base and the amount of Tks each referral brings to you via your ResellersPanel. >> View your Tks Capital Base.